DALLAS (CNS) — During an Oct. 13 Mass at Our Lady of Fatima Parish in Fort Worth, the pastor, Father Jim Khoi asked for prayers for Nina Pham, a Dallas nurse who grew up in the parish and is now in the news as the first person known to have contracted the Ebola virus in the United States. “She’s very comfortable. She’s very supported now. She knows that everybody knew to pray for her, especially in this difficult time,” the priest told The Dallas Morning News daily paper. The priest has been updated on the condition of the 26-year-old nurse at Texas Health Presbyterian Hospital by her mother. The Phams have been longtime parishioners at the Vietnamese parish in Fort Worth. 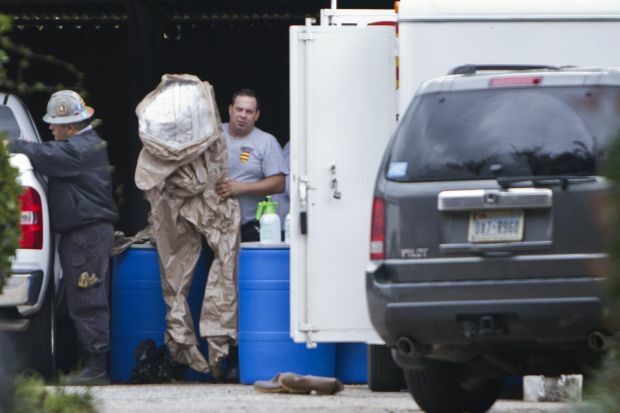 Pham was involved in the care of Ebola patient Thomas Eric Duncan prior to his death Oct. 8. Duncan contracted Ebola in his home country of Liberia and had traveled to the Dallas hospital where he was being treated. The Centers for Disease Control initially said Pham’s contact of the virus was likely a protocol breach, but the nurse is said to have worn the required protective gear and is believed to have followed the hospital’s procedures. “Her mom is very calm and trusts everything to God’s hands,” the priest told the Dallas newspaper. He also said he has faith Pham will recover. Pham, who is currently in isolation at Texas Health Presbyterian, has been conversing with her family members by Skype. She received a blood transfusion Oct. 12 from Ebola survivor Dr. Kent Brantly, who had been working with Ebola patients in Liberia when he contracted the virus in the summer. He recovered in an Atlanta hospital. Pham is a 2006 graduate of Nolan Catholic High School in Fort Worth. When the school community found out she contracted Ebola, it organized a rosary service at the school’s chapel. According to The Associated Press, Pham’s apartment has been thoroughly cleaned after tests confirmed she contracted the disease. Her dog, Bentley, is being cared for at an undisclosed location. A person who came into close contact with Pham has been placed in isolation at the Dallas hospital. Our Lady of Fatima parishioners have praised Pham for her outgoing and kind personality. “I just pray to God that everything is all right,” he said.